Upon entering through the old manor house gates, one has a sense of leaving the stresses of the outside world far behind. Firgrove Manor is a private Grade II listed residential manor house originally built in 1736 and sympathetically converted to flats and houses in 2004. 1 Firgrove Mews,a freehold cottage, enjoys an enviable and secluded position attached to the main manor house, overlooking a landscaped courtyard with raised pond and water feature. Accommodation comprises of open-plan kitchen and lounge with original feature Georgian windows to front and side. To the first floor, there are two double bedrooms, the main bedroom enjoying views over the courtyard and communal grounds, both are serviced by a quality Heritage bathroom suite. Parking is allocated for two cars. An ideal purchase for an investor or for the discerning buyer looking for something special. 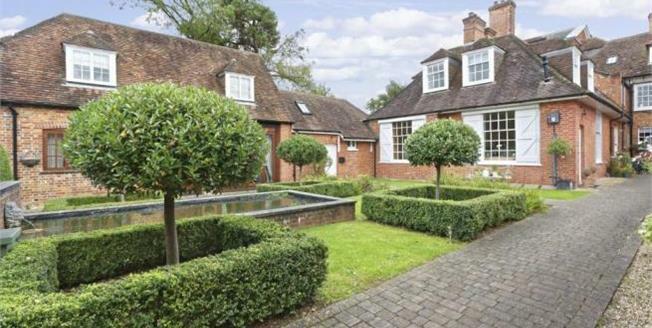 Situated in the heart of the ever popular and sought after village of Eversley. Eversley is a village and civil parish in the Hart district of northeast Hampshire, England. The village is located around 11 miles (18 km) northeast of Basingstoke and around 2.5 miles (4 km) west of Yateley. The River Blackwater, and the border with Berkshire, form the northern boundary of the parish. Amenities include local village post office/convenience store, and several revered gastro pubs and restaurants. For those that love the great outdoors, there are an abundance of woodland walks and bridal ways. Sporting facilities include a cricket ground, which is the oldest in the South of England, and Horseshoe Lake Watersports Centre. There are excellent road links via the M3 and M4 corridors.